An 11-year-old girl who was badly burned when boiling water was poured on her during a sleepover is talking about her horrifying ordeal. 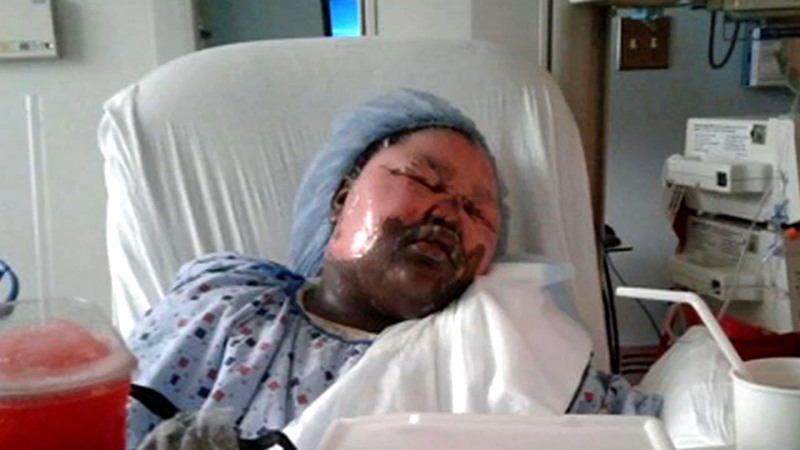 HARLEM, Manhattan -- An 11-year-old New York City girl who was badly burned when boiling water was poured on her during a sleepover is talking about her horrifying ordeal. I had to ask the question because Jamoni Merritt was smiling the entire time we were together. And that amazed me because two weeks ago, a 12-year-old poured boiling water on her as she slept in the Bronx. It was apparently part of a prank by a girl who had been bullying her. "I can't be angry," she told me. "I have to be happy." In this web extra, Jamoni Merritt talks about being burned by boiling water during a sleepover in the Bronx borough of New York City. Jamoni was scalded with second- and third-degree burns across her shoulders and 85-percent of her face. "When I fell asleep all I felt was hot water dripping down on my face, and they put me in a cold shower and threw ice on me," she said. "I started screaming and yelling. At first when I was in the hospital, I was looking sad and stuff, and crying." She can't go out in the sunlight for extended periods, as her burns heal. And if she's lucky, the burns will fade and her face will return to its natural color. Jamoni is keeping a positive attitude, despite the horrific ordeal. "Now when I'm home, I just smile, dance and get ready for tomorrow," she said. Her mom is amazed by Jamoni's resilience, but she's also concerned. One child has been charged but she wants two other girls and the girls' mother to be arrested, as well. "I just want justice for Jamoni," she said. The family's attorney insists the prank was inspired by videos on YouTube, all labeled the "hot water challenge."